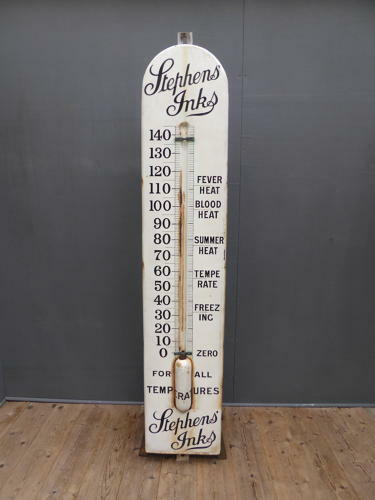 A beautiful, large early vintage enamel advertising thermometer sign for Stevens Inks. A stunning & extremely rare piece of advertising & a wonderful decorative piece in thick black & white enamel. Manufactured by Ralph & Jordan of Bilston, this particular thermometer is an extremely early example dating to March 1897 & features the 'Fever Heat' script which was ommited on later models made by the same manufacturer. Perfect for a kitchen, cafe, restaurant & a fantastic piece for a tattooists! Wear commensurate with age as pictured. unrestored with no thermometer glass is present. Displays beautifully with all original timber back & mounting brackets. UK courier service available at £65 tracked & signed for 24 hour delivery (too large for regular courier, collection & own couriers always welcome).